There are many representatives of this family on campus. Some of the these are: Alocasia sp. (Cunjevoi), Colocasia sp. (Elephant’s ear), Dieffenbachia sp. 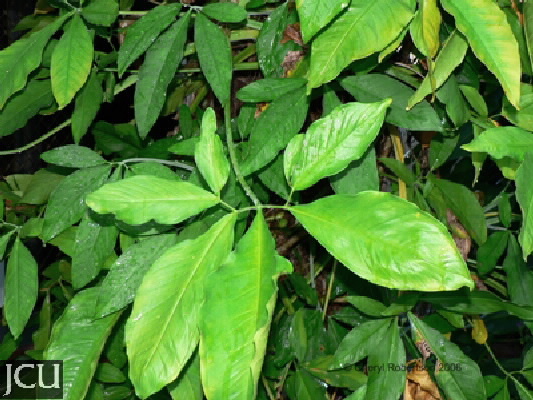 (Dumb cane), Philodendron sp. (Philodendrum), Zanthedeschia aethiopica (Arum lily). 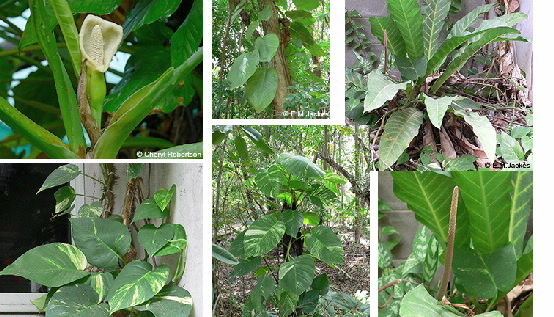 All have dark green leaves and the flower spike is subtended by a large bract or spathe. All contain calcium oxalate crystals which if eaten will cause swelling and pain if not more serious reactions. The fruit of Monstera deliciosa can be eaten only when segments are fully ripe.